Prominent & Leading Manufacturer from New Delhi, we offer equipotential bonding spd, hgs100 explosion proof spd, hgs100 eb equipotential isolating spark gap and hgs100 earthing bonding spd. Equipotential bonding involves joining together metalwork that is or may be earthed so that it is at the same potential (i.e., voltage) everywhere. Such is commonly used under transformer banks by power companies and under large computer installations. Exact rules for electrical installations vary by country, locality, or supplying power company. Stray currents are inevitably propagated in an earthing network. It is impossible to eliminate all the sources of disturbances for a site. Earth loops are also inevitable. When a magnetic field affects a site, e.g. the field created by lightning, differences in potential are created in the loops formed by the various conductors and the currents flowing in the earthing system. Consequently, the earthing network is directly affected by any counter-measures taken outside the building. As long as the currents flow in the earthing system and not in the electronic circuits, they do no damage. However, when earthing networks are not equipotential, e.g. when they are star connected to the earth electrode, the HF stray currents will flow wherever they can, including in control wires. Equipment can be disturbed, damaged or even destroyed. The only inexpensive means to divide the currents in an earthing system and maintain satisfactory equipotential characteristics is to interconnect the earthing networks. This contributes to better equipotential bonding within the earthing system, but does not remove the need for protective conductors. To meet legal requirements in terms of the safety of persons, sufficiently sized and identified protective conductors must remain in place between each piece of equipment and the earthing terminal. What is more, with the possible exception of a building with a steel structure, a large number of conductors for the ligthning rods or the lightning-protection network must be directly connected to the earth electrode. The fundamental difference between a protective conductor (PE) and a ligthning rod down-conductor is that the first conducts internal currents to the neutral of the MV/LV transformer whereas the second carries external current (from outside the installation) to the earth electrode. In a building, it is advised to connect an earthing network to all accessible conducting structures, namely metal beams and door frames, pipes, etc. It is generally sufficient to connect metal trunking, cable trays and lintels, pipes, ventilation ducts, etc. at as many points as possible. In places where there is a large amount of equipment and the size of the mesh in the bonding network is greater than four metres, an equipotential conductor should be added. The size and type of conductor are not of critical importance. It is imperative to interconnect the earthing networks of buildings that have shared cable connections. Interconnection of the earthing networks must take place via a number of conductors and all the internal metal structures of the buildings or linking the buildings (on the condition that they are not interrupted). In a given building, the various earthing networks (electronics, computing, telecom, etc.) must be interconnected to form a single equipotential bonding network. This earthing-network must be as meshed as possible. If the earthing network is equipotential, the differences in potential between communicating devices will be low and a large number of EMC problems disappear. Differences in potential are also reduced in the event of insulation faults or lightning strikes. If equipotential conditions between buildings cannot be achieved or if the distance between buildings is greater than ten metres, it is highly recommended to use optical fibre for communication links and galvanic insulators for measurement and communication systems. These measures are mandatory if the electrical supply system uses the IT or TN-C system. 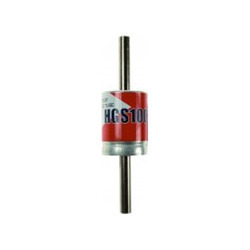 HGS100 Ex - Separating high power gas discharge tube HGS100 Ex for use in explosion hazards areas. It is intended for equipotential bonding of the installation parts of buildings or technological entities which are not interconnected operationaly. In case of p.d. (potential difference) origin between those parts, the high power gas discharge tube ignites and interconnects both parts for a transient time (typical value of internal resistance at startup of HGS100 Ex is 0,001÷ 0,002Ω). Recommended installation is inside of the buildings, outdoors, in the damp rooms as well as in the subterraneous areas. 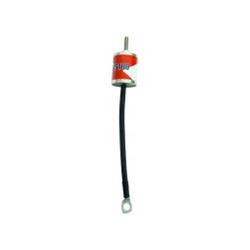 It is an explosion-proof gas discharge tube with flexible connecting cable for equipotential bonding acc. to IEC 61024-1 and also for the use in IT installations acc. to IEC 60364-5-54. It complies with EN 50014 and EN 50028 standards. It is recommended for insulated flanges and insulated screw joints bridging in cathodic protected parts of industrial technology. HGS100 and HGS100 EB are a separating high power gas discharge tubes intended for equipotential bonding of an installation parts of buildings, which are not interconnected. In case of origin of p.d. (potential diference) between those parts, the high power gas discharge tube ignites and interconnects both parts for a transient time (typical value of internal resistance at startup of HGS100 is 0,001 ÷ 0,002 Ω). Recommended installation is inside of the buildings, outdoors, in the damp rooms as well as in the subterraneous areas. For lightning protection equipotential bonding in accordance with IEC 61024-1 as well as for the use in IT - installations in accordance with IEC 60364-5-54.